i always used to skate under the shelter now there is no where else sheltered we can skate. To make the story short, they dislike skateboarders in SCAPE because we are a nuisance to them for creating noise, vandalism and etc. They prefer earning the money from the youths.-" Will be leased to youth entrepreneurs at $14 to $15 per sqft." So whats the point building a place for the YOUTH which in the 1st place it's meant for the so called "YOUNG entrepreneurs"? "ABOUT *SCAPE. *SCAPE Co. Ltd is a non-profit organization with its mission and vision rooted in support of youth, talent and leadership development." No wonder no one visits the place. Not enough free activities and they taking away places we want and need like this sheltered skate space. Thank you Singapore!! we need to do something on our own as a community .. not to rely on this dogs .. Though I've never skated at scape before i think it was a good place for kids to skate and hangout under the shelter.I miss the old skatepark where scape is now but we skateboarders will adopt to any situation and we all know that street skating is still the way to go.minus the harassment from police,security guards and kaypo public. more retail space is the last thing scape needs. how about more programs that support youth and sports. in fact the outdoor playspace was initially just meant for basketball courts..
that space under the shelter is the ONLY place can skate during raining. scape is a joke! it's not meant to be a mall! we dont need more shops..
stand up and fight! petition against this please! lets skate and destroy government property!!! Freak this man ! It's an awesome spot and you have to take it away from us SCAPE ! you dont know how is it like for skateboarders like us to have a place taken from us ! It's my freaking Skatespot ! The kickers , box , the stairs , rail are all perfect ! why do you have to take it away from us. If you close down the space for us to skate at scape, where are we suppose to skate? Somerset skatepark? 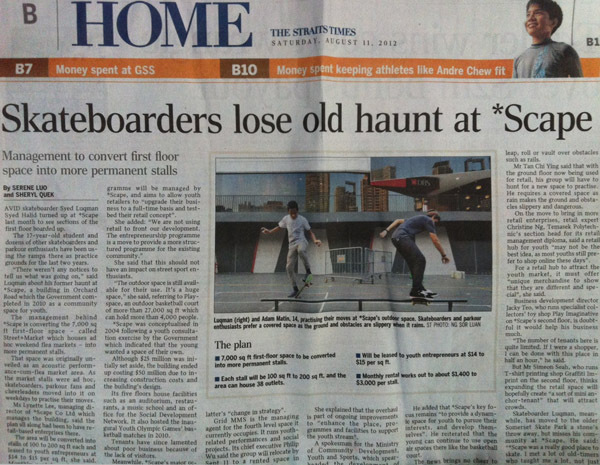 i agree -i skate at scape instead of somerset park cause its much safer as the ground is smoother. 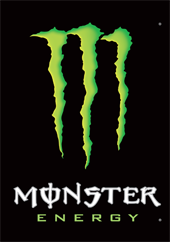 i can also get a drink from cheers and go to the skate shop or have a meal at mcD. its good we have two spots- somerset and scape. and there were always different crowds at each spot. im sad to see when it rains both spots will be unskatable and i will have to stay at home. i dont know why . but i kinda skate better at scape as it has alot of space and its flooring is also beast . i used to skate at the shelter when it rains . cause there's no place tht we can skate like tht . and truthfully , i hate the securities there . they have this att of hating skateboarders . come on ! skateboarding is a sport ! take it like soccer , or any of the olympic games ! singapore is getting more and more ridiculouis !